A most amazing chain of events happened to me lately, starting with last week. It’s so filled with “coincidences” that I had to blog about it, just to process and actually make the list that’s blowing my mind. 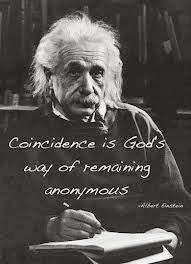 As they say, “There are no coincidences.” After reading this, you might just agree. I can’t think of any better evidence that this could be true. Another girl noticed Rayna’s shirt, and asked her, “Are you from Cleveland?” Rayna replied that yes, she is, and we just moved here. The girl, Hannah, said she had moved here from Cleveland ten years ago. And they started talking. Rayna came home and told me about it. I thought that was cool. Well, shortly after Rayna came home from school that same day, a school secretary called to say that she had found Rayna’s math binder in the Guidance Office, where Rayna had been keeping her too-large-for-a-locker backpack. Rayna exclaimed that she needed that folder for her homework, so I sent Rayna on her bike to go up to school and get it. Rayna cajoled her sister, Sari, into coming with her. It just so happens (here comes the flood)…that Hannah and her sisters and mom were at school when Rayna and Sari got there. They were all talking excitedly about Cleveland, and when Hannah’s mom heard Rayna’s last name, she said that she knows me from the same temple where I had worked, where she belonged before they moved here. She remembered me, and remembered that I had some notoriety there because I wrote the Apples to Apples: Jewish Edition games. Not only that, but she also knew a bunch of the same people that Rayna and Sari knew from school in Cleveland. She gave them a ride home with their bikes so she could say hi to me. Last night, we went over to Kelly’s house for dinner. The game of Jewish Geography (that’s what it’s called when Jewish people connect everyone they are mutually acquainted with) went on and on, of course. Most amazing of this was that Kelly’s husband knows Evan’s aunt and uncle, next door neighbors from his parents’ house, and about a zillion other people that Evan or the both of us knew from school years and from living in the same area. And, also, our kids went to the same pediatrician (who is also my cousin). She has four kids, as do I. Her two youngest are in the same grades and school as my two oldest. Her older daughter does pet sitting (something we also needed to find for when we go on vacation in May, and if/when we visit Cleveland on a long weekend between now and then). During the course of conversation, Kelly said that she loves and has been to Lily Dale three times. I’ve taught in Lily Dale for the last two summers, and will teach there again summer of 2014!! The odds that the first person I “randomly” meet from Maryland is into holistic/metaphysical stuff, and has been to Lily Dale, are rare enough, let alone that I am sitting having dinner with this same person, and she knows me from living in Cleveland, and we went to the same temple…I mean, these are lottery winner odds. She also went upstairs, got her little bag of stones and a pendulum, and we played with those for a bit, while sharing stories of how we’ve found lost items using intuitive techniques. And yes, there’s even MORE!! Kelly also told me about a metaphysical “church” around here that’s having a healing service this Sunday, and I suggested that we go together. So she’s going to pick me up, we’re going to go there, and then get some lunch in Georgetown afterward. And I’m thinking back to how I had created goals for myself before moving here. One of the goals I’d put out to the Universe is to get acquainted with others who are into holistic work out here. How gorgeously generous of my Guides to arrange for me to meet Kelly, someone with ties to back home, and for her to be one of the people who will help me meet this goal. Since writing my last post, I’ve also found a local place for my Reiki practice and have scheduled a Practical Reiki 1 & 2 Training at a lovely wellness center in DC. I also connected with the director of another Reiki organization, and we’re having lunch together this coming week, and I joined a couple Meetups in the area. My new website will be launching at the end of next week, too. Things are moving, and they’re happening easily, and in absolutely incredible ways!! It’s like the universe is saying YES, but not subtly. BIG, bold, and right up in my face!